It’s been a strange and difficult few days. I woke up last Tuesday night at 2am with the worst headache of all time; piercing intense pain. I had to run downstairs for the pain killers. This was stress, pure and simple; subconscious anxiety in anticipation of GCSE results download day. I’ve only been there a year but Results Matter – and in this age of hyper-accountability, they assume meaning far beyond the limits of their validity and reliability as measures of our students’ experience. It wasn’t good news; various factors had lined up to generate results at the lower end of the range I’d expected. The KS2 profile of this cohort generates an expected figure of 39% on the national transition matrices for 5A*-CEM; that’s about where we are – in line with expectations, not even taking account of the 73% FSM factor. Naturally, we’re not allowed to call that success and it doesn’t feel like it! We’re one of the schools with masses of students on the C/D borderline in Maths experiencing drops following the grade boundary change on the Edexcel Higher paper. 50 of our students got a D. With outcomes virtually a zero-sum, a gain of 5% in School X must be accompanied by a drop of 5% in School Y. (Strictly speaking, 4.3% on average since Nationally maths went up by 0.7%). It’s a fact of how our system works: not all schools can improve their Maths GCSE grades in the same year. It’s a contest for the allowed number of passes at A*-C; there are winners and losers. There’s some comfort in hearing of lots of other schools in the same boat – but not much! Despite real improvements in Science, History, Geography and English Literature and more A/A*s in French, Art and Music, our Maths-English alignment was unhelpful! 13 students with a D in Maths would have also secured 5A*-CEM if they’d gained a C; several of those are just a few marks away. These are the margins. Of course there were individual successes – students with hatfuls of As and A*’s and lots of other wonderful individual triumphs – as always. But despite matching the average national trend for the cohort, no-one is jumping for joy. The week before, after our very positive A level results, I received lots of emails congratulating staff on their hard work; by comparison there’s been a conspicuous tumbleweed response on GCSEs. As if the staff worked any less hard!? It seems that some of the people who like to bask in the glory and get a piece of it when things are looking good – regardless of their contribution – are quick to distance themselves when things don’t look so rosy! Sadly. Inevitably. It’s painful for some to accept that previous results were not based on a more deeply rooted learning culture; the success was too fragile and the exam regime has exposed that in no uncertain terms. We’ve got a raft of strategies to embed a deeper learning culture with less reliance on Y11 intervention. We’re transforming standards of behaviour so lesson disruption is absolutely eliminated. We’re investing in staff development in a very significant manner and doing all we can to retain our staff so that they have time to grow and gain the experience they need. We offer amazing curriculum breadth and opportunities for personal development and enrichment – not least in music. – the list goes on! We’re hugely ambitious for what we can do and I know that students of all kinds receive a superb education at my school. When I stand up in front of parents at our Open Evening in September I will be totally sincere when I tell them how exciting it is to be at Highbury Grove and how positive I am about their children’s pathway to success, regardless of their starting point. However, in terms of exam outcomes, we need to be really clear that there are no easy wins or quick fixes. Not any more, especially for large established comprehensive schools with a culture to shift. (New schools and selective schools have it easy by comparison for sure.) The schools I look to for inspiration are those where their KS3 is the engine room of their success; not their Y11 intervention programme. I know schools where they’ve already created a deep learning culture; where no student would dream of being late to an exam; where the default peer group position is an acceptance of the need to work hard, at home and in class; where the aspirations for success are sky high. But it took them five years. That’s our direction of travel and I know we’re on the right road – parents, students and teachers reaffirm that every week. For sure, our new Y11 is expected to achieve significantly better. The tricky part is that all this takes time and patience. There’s a real danger that at times of stress, when the public face of success (even if based on single data points) has been dented, that pressure for short-term gain deflects us from the taking the deeper long-term path. I’m not immune to that pressure. In fact, I’ve never felt as much pressure as I feel right now. I’ve asked myself some hard questions – even though it has just been one year! (Can I do this? Is it worth it? Should I be playing the game more? That kind of thing.) I need at least three years to get this right and it already feels like a tightrope of expectations: The rewards of success are huge but if you fall off the wire, it’s a long way down. I can tell you this: the thing you need the most when the pressure is on, is for people to say that they’re behind you. Conspicuously. Don’t hold back people! With the system going the way it is, we can’t be sure that success will come via improved exam outcomes on the same scale as before. Securing good GCSE grades and adding value are still a zero-sum (and I remain to be convinced that P8 will change that). In that context, saw-tooth fluctuations are to be expected; they are normal – they happen in great schools with great heads and great teachers. We need to develop more sophisticated responses to that and educate ourselves out of our system-wide delusion that everyone can be average or better. It’s not complacent to accept this as the truth; it’s only complacent to stop striving for improvement, and you won’t catch us doing that. Just give us the time and space we need! « Conceptual ideas on school leadership – a video library. Good luck, Tom – Alex Ferguson is always the football manager people mention in this context – you’re absolutely right that you can’t judge the roots of the tree on the harvest of one season – keep growing strong roots and keep giving the rest of us great gardening tips! Schools need to be brave enough to focus on the long term habits and dispositions of students instead of panicking into quick fixes for their exam performance: you’re leading that shift. Inspirational writing yet again TS. Another honest and reflective piece that strikes chords with far more school leaders than the barrage of banners quoting massaged figures. The reality of emotion for school leaders (even those in schools that have done brilliantly well) is much more sombre than headlines would lead the public to think, it is always about the “only ifs” and “if onlys” as well as looking to the year ahead in order to make things better for students and staff. This blog will encourage those teachers to take heart, stay determined and lead their schools with integrity. Your words are inspirational so thank you for sharing them. Tom this is a brave and honest post that all heads can relate to . You are absolutely right when you say that KS3 is the engine room ; all too often schools see extra revision sessions in Year 11 as the panacea . Keep going ! Great post – brave and authentic. We need more of this type of honesty when discussing school results rather the superficial glorification of results which are product of quick fixes and gaming. It’s only by creating a climate when we can talk about results in an open and supportive manner that we will be able to create the changes in the education system which are so desperately needed. In many ways the most motivational post I’ve read in a long-time. You’re right to play the long game Tom so don’t lose faith – KS3 IS the key – get that right and the rest follows and that means it might take a few years. You’ll get there – I sometimes think the way through this is to teach as if there were no GCSE – as if the world was your oyster and there were no limits on what might be discovered. And to pass that passion and vision on. You have passion and vision in spades. I think you are on the right path, Tom. KS3 is the key: Year 11 intervention way too late. Miracles won’t happen over night. You have passion and vision and courage – be encouraged and soothed by that. And for what it’s worth, I’d still work for you and with you in a heartbeat! Thanks tom for writing this. First year leading dept and trying to make big culture shift. Results hopeless this year and temptation to abandon bigger aspirations and fall back on the same old. Reading your piece has rejuvenated my longer term plans which can make a big difference. A brave, honest and inspirational post. Thankyou. Like everyone else above, I am so grateful that even in an hour of disappointment and anxiety you can continue to write with such breathtaking honesty and integrity and insight – don’t doubt yourself for a second, Tom. Great leaders and great teachers do not become poor overnight. We cannot control the centrally driven changes; although we may attempt to influence (@headsroundtable). I read that there will be plenty of volatility, throwing up big swings in results for schools like the ones we lead until 2020. I have no doubt that the sleepless nights leading upto results (and the ones we have has heads anyway) will happen again. I just hope good Heads, who receive these blows, can push on true to the core value that every child deserves the very best education, and that governors and sponsors will look beyond the drop, seeing the bigger picture, backing their people to keep doing their best to improve the life chances of the children they serve. I hope the DFE and Nicky Morgan in particular realises that some Heads will walk from the professional despite having much more to give and potential Heads will not pursue this career option because of the pressures of Headship in the current climate. I do hope I am wrong, because this job is the best in the world. You the man Tom. You the man. An honest account Tom. It is refreshing to hear a leader talking in this way. All the best for the future. Anyone who truly believes in the proper way of educating young people will be wishing you and your school success over the next couple of years and beyond. Thank-you for this Tom. Much appreciate your clear thinking and honesty. You have spoken for so many heads, Tom. This is a brilliant, honest account that has clearly resonated with lots of readers- myself included. You have helped a great deal of people- many thanks. We’re fortunate that in Ireland we’re not subject to this level of scrutiny and results are also not published publicly. I think we need to take advantage of this. I have used an extract of your post above in mine. Hope that’s ok.
Just catching up with this, Tom. I do understand and sympathise – I know it’s on a different level but at the end of my first year as Head of English our Year 11 GCSE results took a dip, for a range of reasons (and they were fine after that) but I remember acutely how I felt as the HoD responsible that first year. And you’re disappointed for individual students as well as having concerns about the overall data. You’re absolutely right that there are no quick fixes. Establishing and securing success takes time. It seems to me that you’re saying and doing all the right things. Very best wishes for the year ahead. Oh, so much to respond to Tom! I’m long out out of the job, in school, but do remember the stress as Head, or perhaps it’s distress you describe. My longer view allows me to see, illuminated by your other writing, that your visual metaphor of that high wire is misplaced. Indeed, you have commented on the #solidarity in the comments so far. 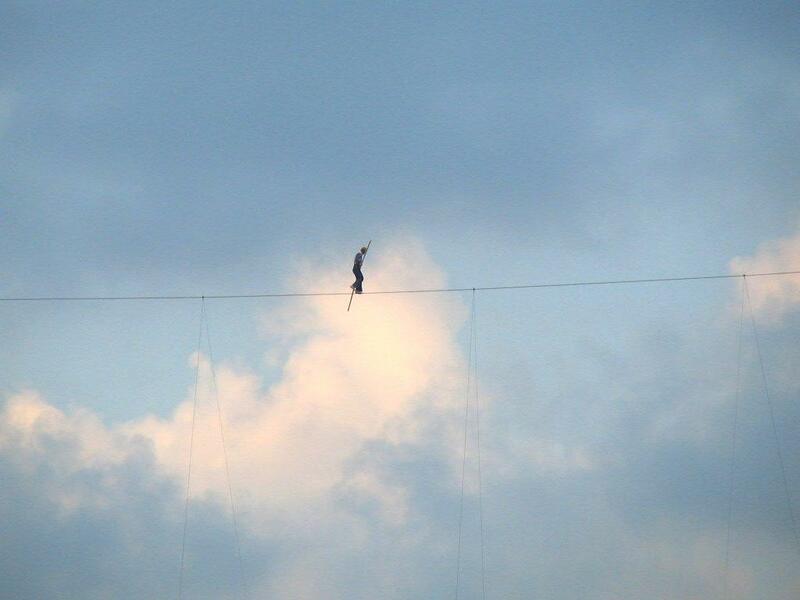 It is not a tightrope it is a net, there are others there with you. I’m also sad that the few significant determinants, thrust on us as a profession, are taking such a toll on such a leader. How is it for the less open and practised self-evaluators? I’d just add a thought (you’ll know it well) consider the more important success criteria of a school you will allude to in your parental address. Happiness, fulfilment, togetherness, care, initiative and endeavour to name a few. The absence of these really should keep uscawakevat night. I guess you can sleep soundly and I wish you will in the final days of your well earned holiday. One day you’ll be building a tree house, reading the paper, climbing mountains and playing music at will and even working when you fancy it (as I do now). Keep the faith in what schools are really for! Thanks so much John. A wise response. You are right about the net. I met my Chair and Vice-Chair today and I feel superbly well supported; they’ve given me the most fabulous vote of confidence. I’ve also received countless messages via email and online to offer support and encouragement, come what may. There is definitely a net. Thank you. Given that there is such reliable prediction of a school’s GCSE results based on the Point Scores at Key Stage 2 (or from CAT scores), why do headteachers still falsely allege that results have much if anything to do with the schools per se, rather than the subset of the gene pool which the school receives as admissions in Year 7 five years earlier… Especially given the now extensive evidence from international research that most of the variance is explained by herdity and that the variance which is not (Non-Shared Environment) is not attributable to teaching or parenting and thus beyond *anyone’s* ability to manage”. Your use of the phrase “gene pool” gives you away. Given that there is such reliable prediction of a school’s GCSE results based on the Point Scores at Key Stage 2 (or from CAT scores), why do headteachers still falsely allege that results have much if anything to do with the schools per se, rather than the subset of the gene pool which the school receives as admissions in Year 7 five years earlier… Especially given the now extensive evidence from international research that most of the variance is explained by heredity and that the variance which is not (Non-Shared Environment) is not attributable to teaching or parenting and thus beyond *anyone’s* ability to manage”. Tom, your prose and your vision (National Bacc etc) continue to be an inspiration. Please just carry on carrying on! You’re a beacon! I’m just finishing writing up my PhD thesis (on film & digital media making in primary/early secondary) and reference your work at Highbury and beyond (Chris Waugh, whose work you know, is one of my case studies). Thankfully there is a posse out there taking the long view on cultural / educational shift.